No time for the gym but still want to be healthy and stay in shape? Well, bodyweight exercises can benefit you! Even without additional weight, these exercises can build strength, muscle, and fitness while helping people lose weight. The goal is to use your own body weight as resistance, by pushing, pulling, or lifting it. And if you don’t have time, don’t worry! These exercises can be done whenever and wherever. Your physical therapist will most likely include body weight exercises into your treatment program. He/she will cater the regimen to the specific condition at hand. Such exercises include strength training to build muscle and cardio to keep the heart strong. Based on the patient’s starting point and age, the therapist will determine the pace of each session with the quantity of exercises and how many repetitions to perform. With body weight exercises, patients can complete their full range of motion without restraint, allowing joints to move freely and decreasing the risk of injury. You’ll be able do these exercises at home with little to no cost, as equipment is not needed. Bodyweight exercises are considered “closed chain” which is the scientific term for saying moving the body through space instead of an outside object. Closed chain exercises have been proven to increase lower body strength by 31%, whereas, open chain exercises only increases it by 13%. The reason is because moving the body through space increase the amount of muscle fibers used. Thereby, yielding more results. If you’ve been sitting at your desk all day, it’s probably best to not go and sit down on a machine at the gym once again. 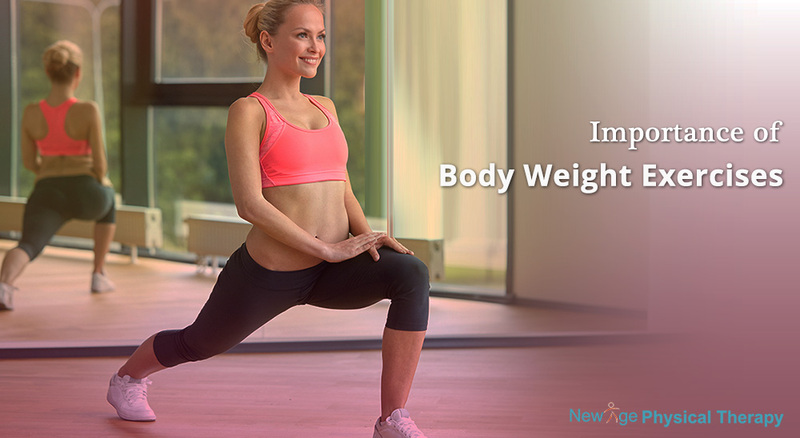 Body weight physical therapy helps patients reestablish good movements. It allows movement in multiple ways that can activate muscles in the back, knees, and shoulders, thereby, keeping them healthy. This may be a better alternative to machines that can be limiting. Examples of bodyweight exercises include planks, push-ups, squats, sit-ups, marching, and lunges. Since physical therapists are professionals in body movement, it’s best to consult one to see which exercises are appropriate for you when dealing with an injury.